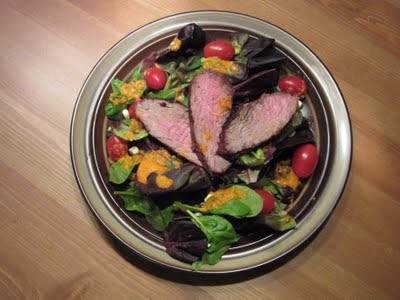 Chris made his world-famous tri tip tonight and I went all omnivore on him, making a salad with the tri tip, mixed greens, cherry tomatoes, fresh white corn (raw, cut right off of the cob) and a roasted red pepper vinaigrette. To roast bell peppers, either toss ‘em on the grill or throw them in the broiler, turning occasionally, until skin is charred and blistered. Remove from heat and place them in a paper bag for a couple minutes (wait until they’re cool enough to handle) before removing skin, stems and seeds.